I wrote a review of Amy Walker’s On Bicycles for the Sightline Daily Blog. I’m cross-posting about it here because I thought some of my readers would be interested in the review, and also because Sightline is a smart, interesting organization that you should know about. Read the whole review on Sightline, and here are a few paragraphs to get you started. Bike books are like bike infrastructure. Their purpose is either to attract new riders, or appeal to experienced users. Effectively appealing to both groups is difficult, if not impossible. 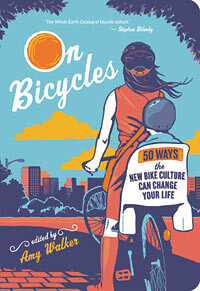 Yet that’s what On Bicycles: 50 Ways the New Bike Culture Can Change Your Life does. It’s an all-around guide to bike culture, filled with useful information and bursting at the seams with earnest enthusiasm for all levels of interest. But will this self-proclaimed bike culture make the bicycle a vital part of North American transportation networks? Does bike culture necessarily help to bring bicycling to the mainstream as a method of transportation? Read the rest of the review on Sightline.